You can market your brand by setting up a Google+ Badge. My personal recommendation is that if you can choose the Google+ Badge, as opposed to the link to your Google+ Page, do it so that people can circle your Google+ Page directly from your website and know that it’s there. Go to the Google+ Badge Page. On this page, you see a form you can fill out to get the HTML code you need to paste into your website. Select the Google+ Page you want to associate your website within the drop-down list on the form. Configure the design of your Badge. Currently, you have the option of choosing an icon, a small Badge, or the standard-size Badge. Select each option to get a preview of what it looks like; then select the one that fits your website best. If you want, you can dive into the Advanced Options below the form, but by default you should have everything you need here. Copy the code and paste it into your website HTML. When the form’s filled out, copy all of the HTML that’s in the box on the right and paste it where you want the Badge to go on your website. 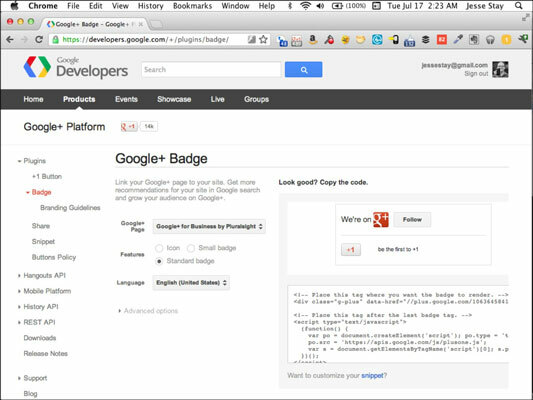 The result is a Google+ Badge that you can integrate well with the design of your site.